This is a 4 volume set about the Scots in Canada and the great part they played in its creation. This is a 2 volume set with volume 1 being on the Scots in Eastern Canada and volume 2 being on the Scots in Western Canada. Being the substance of a lecture by Scots Canadian Poet John Imrie. These are extracts from this publication which was printed in 1904. John McDougall was born in 1842 in Sydenham, Upper Canada to George and Elizabeth McDougall. George McDougall was a Scottish Methodist missionary and, as a result, John grew up attending mission schools and learning to speak Ojibwa and Cree. He wrote several books about his life growing up in Alberta. By William Renwick Riddell, LL.D. In 2004, in a vote conducted by the CBC, Canadians elected him the Greatest Canadian of all time. The fight to keep the site in Georgetown, Ontario. The 2008 Faire outside Wallaceburg. Some pictures from the 2007 event courtesy of David Hunter. The Hastings & Prince Edward Regiment is a reserve infantry regiment of the Canadian Armed Forces. He was knighted in 1609, granted the plantation of Nova Scotia in 1621 and made Viscount of Canada. He was appointed Secretary of State for Scotland in 1626, and was created Earl of Stirling in 1633. Famous Archivist of the Dominion of Canada from 1872. The War of 1812 was fought largely in Southern Ontario, on a front from Michilimackinac in the Northwest to the St Lawrence river, especially in the small area between Lake Erie and Lake Ontario. Historians regard the war as a critical event in the histories of the United States and Canada. The Bethune family trace its lineage very far back in Scottish and French historical records. The first of the name came to Scotland in the reign of Malcolm the Third, a contemporary of William the Conqueror, in the eleventh century. Was the son of Mr. Angus Cameron, formerly of Argyleshire, Scotland, and who came to Canada in 1806, as the hospital sergeant of a Highland regiment. Of Toronto and born on 12th August, 1819, at Carbrook, Stirlingshire, Scotland, the country seat of his father, John Campbell, W.S., who was born in 1770, and who was the great grandson and representative in the male line of John Campbell of Easter Shian and Garrows, in the County of Perth, grandson of John Campbell of Edramuckie Castle, on Loch Tay. By name and blood a Scotchman, by birth an Englishman, and by adoption a Canadian. Principal of Knox (Presbyterian) College, Toronto, was born in the Parish of Kirkcolm, Wigtonshire, Scotland. This is a pdf file of the book in which you can learn about the many Scots who settled in this place in Ontario. Names like McIntyre, Wright, Ross, MacLean, and many others. He later commenced fruit growing and packing, etc, he introduced the present improved mode of handling fruit for market, and is now running the largest fruit package and basket factories in Canada. Barrister-at-law and County Crown Attorney, Hamilton, was born at Crieff, Perthshire, Scotland, in 1836. In 1879, he associated with him his brother Thomas, and commenced business in Toronto, the firm being styled A. & T. J. darling & Co. This firm deals in hardware. Through the sound business qualities of its members, it has pushed its way steadily onward, and is now one of the leading establishments of its kind in the Dominion. The Galbraith family is a race of millers, our subject being the fourth generation, all having been engaged in this pursuit. In 1884 he was appointed to the important chairmanship of the Standing Committee on private bills, a position requiring the exercise of much tact and judgment. M.D., Ottawa, Fellow of the Royal College of Surgeons, London; Fellow of the Royal College of Surgeons, Edinburgh; Corresponding member of the Boston Gynecological Society, the distinguished gentleman who form the subject of this sketch was born at Inverness-shire, Scotland, on the 8th August, 1830. He was moderator of the Presbyterian Church of Canada, usually called the Free Church, in 1861, when the union was effected between this church and the United Presbyterian Church of Canada. Dr. Henderson originated the idea of and was the first in Canada to apply successfully the plaster-of-Paris jacket for the immediate relief and subsequent cure of spinal irritation without any deformity. He was destined in the troublous times of 1837 to be in the melee, and was found in the city guards aiding in restoring order and maintaining the law. Always taking a broad and intelligent view of civic affairs and public matters generally, he came to be recognized as one who should be in a legislative sphere. An interesting account of the Scots who settled here and the progress they made. Ex-Mayor of the City of Brantford was born in Perthshire, Scotland, on November 30th, 1844. The Iona area is rich in Scottish heritage. It was first settled in the early 1800's by MacNeils from the Island of Barra in Scotland. Mr. Laidlaw organised a Joint Stock Company, under the name of Laidlaw Manufacturing Company, Mr. Laidlaw occupying the position of vice-president and manager. A review of his fourteen years of official labour would practically comprise a history of Ontario's public institutions' system. His reports to the legislation number fourteen large volumes, aggregating 4,000 pages of printed matter. No less than eight important public institutions were founded and organized under his supervision. The eminent, and distinguished geologist, was born in Montreal on the 20th of April, 1798. His grandfather, James Logan, and his grandmother, Margaret Edmund, were natives of the parish of Stirling, Scotland. He arrived in Toronto in 1878, and has been practising his profession in that city every since, each year with increasing success, till now he had one of the largest practices established in the Queen City. Was descended from a Highland family of much antiquity and respectability, and was born at St. Raphael, on December 12th, 1812. It was he who led and shaped the movement, and conducted negotiations in the maritime provinces and in England; and in recognition of his zeal and service he was called to lead the first administration under confederation, and had a knighthood conferred upon him. During the last four years of his political life he was a member of the Government, both in the Blake and Mowat administrations, as Commissioner of Public Works and Minister of Agriculture and Emigration, and afterwards as Provincial Secretary. He managed the construction of the celebrated Thames embankment, one of the most wonderful works in the world. He was prominent in establishing the Dominion Telegraph Company, and was vice-President of that organization for many years. He was also a Director of the Wellington, Grey & Bruce Railway during the construction of that road; was an alderman in the city of London and Hamilton. The staunch and impulsive Reformer and editor of the The Colonial Advocate. M.P. for the city of Ottawa and editor of several newspapers. Was appointed Speaker of the Senate, and member of the Executive Council without portfolio, and this position he held till the 17th of October, 1883, when he resigned the speakership and was appointed Minister of the Interior. Perhaps the event in his career of which he feels and ought to feel, most proud, is having obtained in England, before the Judicial Committee of the Imperial Privy Council, a decision in favour of Ontario for an extensive territory long in dispute and supposed to comprise 100,000 square miles. 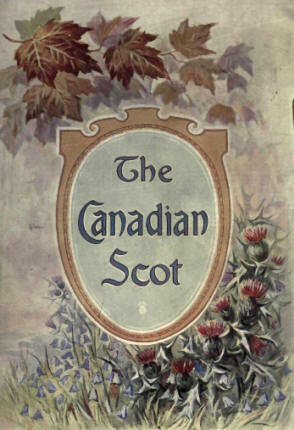 Here is a listing of books about Scots in Canada that are held by the National Library of Scotland. One of the leading and most public spirited mercantile men in the "Queen City of the West". Lieutenant-Colonel, commanding the 1st Provisional Brigade of Field Artillery, Active Militia, Barrister-at-Law and Solicitor of the Supreme Court of Ontario. The head of the well-known firm of organ-builders at Guelph, Ontario. D.L.S., C.E., Professor of Agriculture, Guelph Agricultural College, was born on the 14th April, 1835, at Turriff, Aberdeenshire, Scotland. He is a son of James Brown, LL.D., author of "The Forester", and now a resident of Port Elgin, Ontario, Canada. Author of "Manitoba; its Infancy, Growth and Present Condition" and many other books. Taken from the Colonial Advocate, Thursday, June 3, 1824. Published by W. L. Mackenzie, Bookseller, Queenston, Upper Canada. By WIlliam Lyon MacKenzie in 1837. The settlement of Wallaceburg, Ontario. An M.P. lawyer and developer. Partner in the North-West Company of Canada. Cape Breton musician who served as honorary chieftain of the Fergus Scottish Festival and Highland Games for more than 20 years. Father and son created the largest diary operation in Canada.